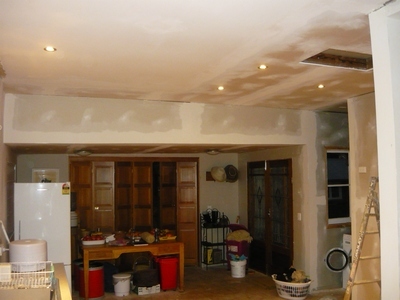 A few weeks after having the first part of the kitchen installed it was time for stage two!. 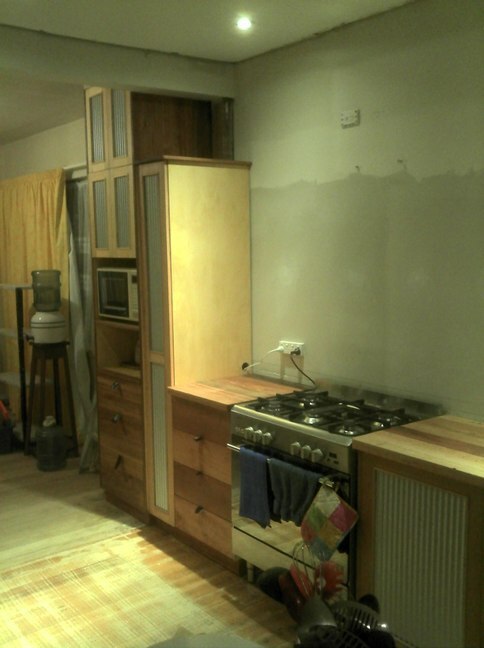 We decided to use the carcasses of the kitchen cupboards that were already there and the existing sink. 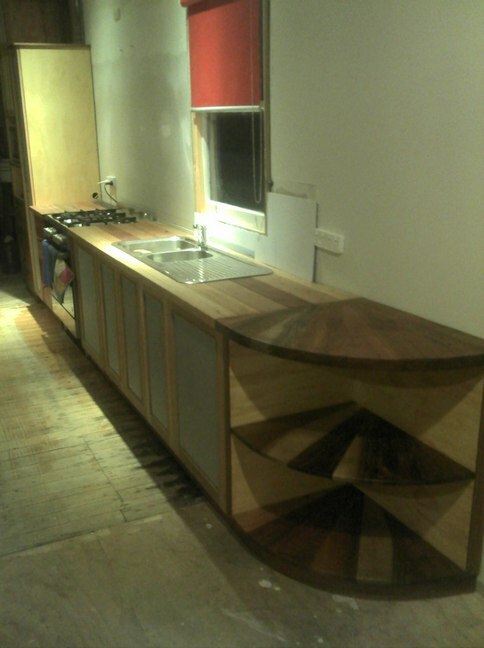 The benchtop was laminated chipboard and the doors were vinyl covered MDF. 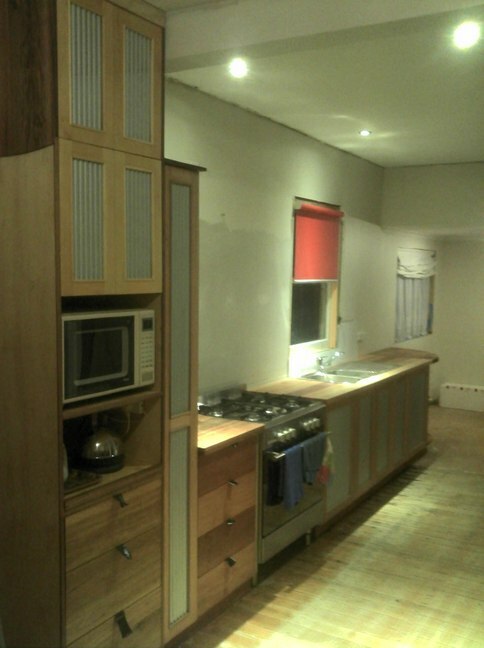 Basically your bog standard kitchen. As ever we had to do some finishing off in the wall remodelling department. 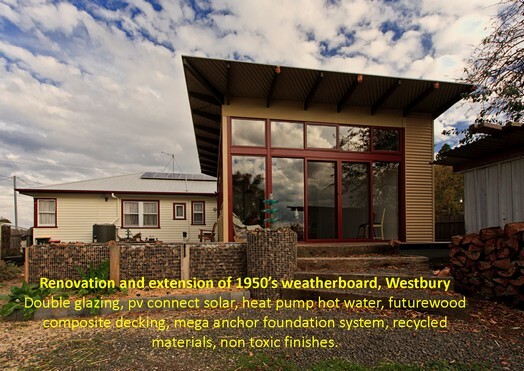 The West wall (behind the sink and stove) was a mix of materials. 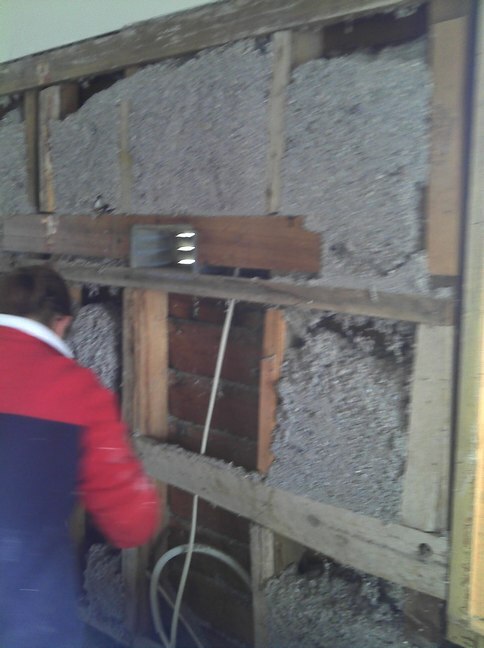 At the top it was plaster board glued to the lath and plaster. Below this it was plasterboard glued to 3mm random groove plywood. We decided it should come off, move some power points and re-plasterboard. This of course led to more plastering of joints, more sanding, more dust etc. West wall before removal. What a mess! 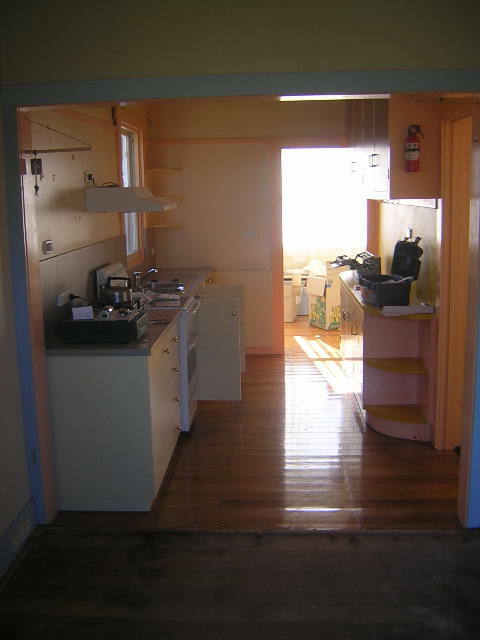 The main problem prior to the redesign was that the bench space was zero between the stove and the sink with no bench space for dishes etc. The stove would end up covered in dirty dishes. To alleviate that problem I cut one of the kitchen units in half. One side was four drawers. This stayed where it was to the left of the stove. 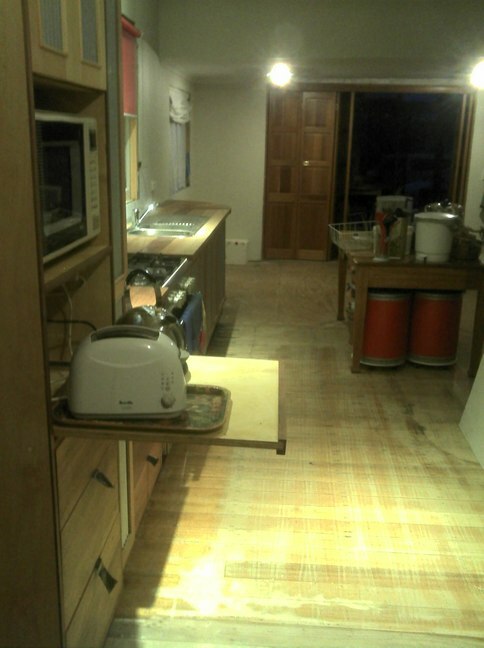 The other half, a cupboard, was moved to the other side of the stove. 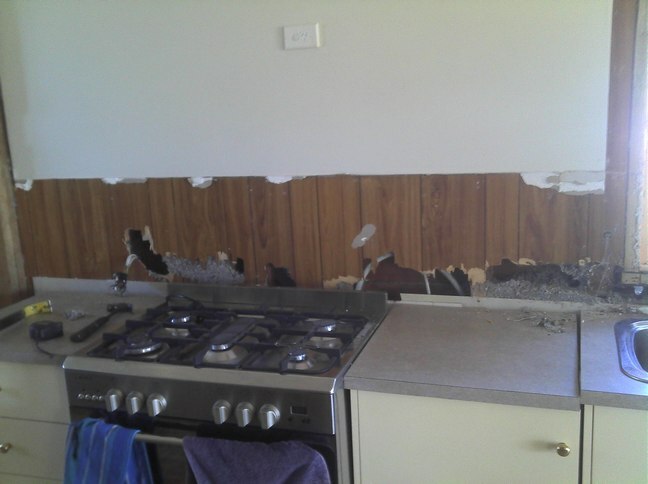 The sink was shifted along to the right by approx 250mm. Once all this was done Michael Thomson from Tasmanian Sculptural Furniture came back and measured up. We wanted a full height cupboard on the left hand end of the bench that could take the microwave and a slide out bench for the kettle & toaster. Next to this we have added a narrow cupboard which will have slides in it to hold brooms and assorted cleaning stuff. At the other end we extended the bench down to the dining area window with an arced shelf unitat the end.. The last cupboard would have two heavy duty slide out shelves for saucepans and other heavy stuff. There was still quite a lot of timber left from the initial build. small slabs of blackwood, myrtle, huon, and kaurie pine. 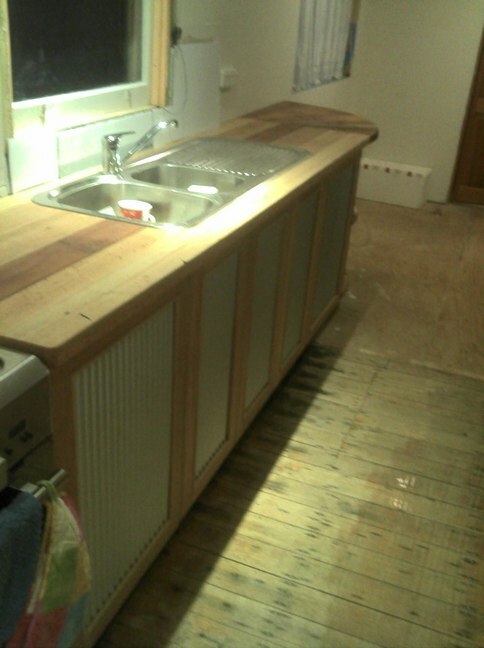 However there was not any long lengths needed for the sink bench. My mate Lee came to the rescue with some assorted lengths of hardwood including some red gum. All were grey and weathered but under Michaels tender care came up a treat. The doors were given the same treatment as the other half of the kitchen using zincalume miniorb for the infill. It has now been fitted into the kitchen and looks great. The bench has been treated with Livos countertop oil a natural finish that withstands heat up to 50 degrees. It needs a final sand and one more coat of Livos We have just bought the handles from SUPPLY on the Don Road in Devonport. They are wholesalers of kitchen benchtops, doors, handles, locks, rangehoods, anything to do with the building of kitchens in fact. 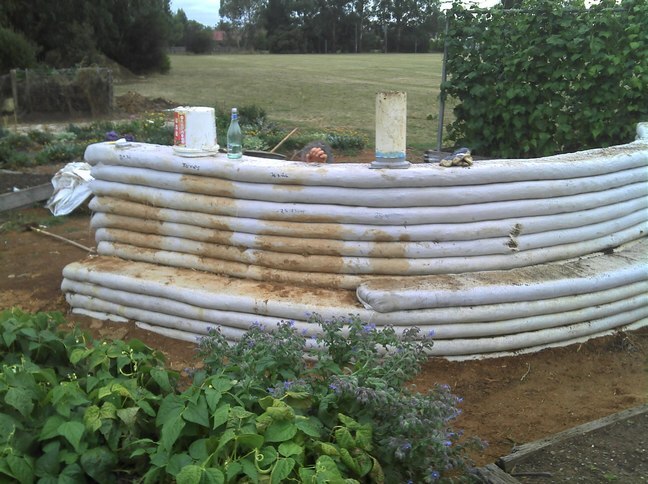 A year ago I was approached to see if the Westbury Community Garden would be interested in facilitating the building of an experimental earthbag wall and seat. 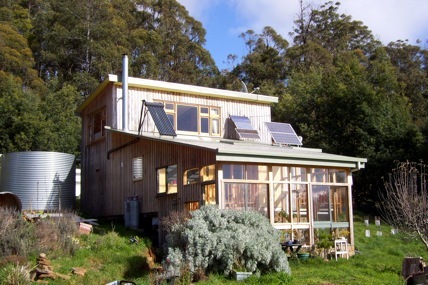 In June 2011 we started the process with a workshop in earthbag building. 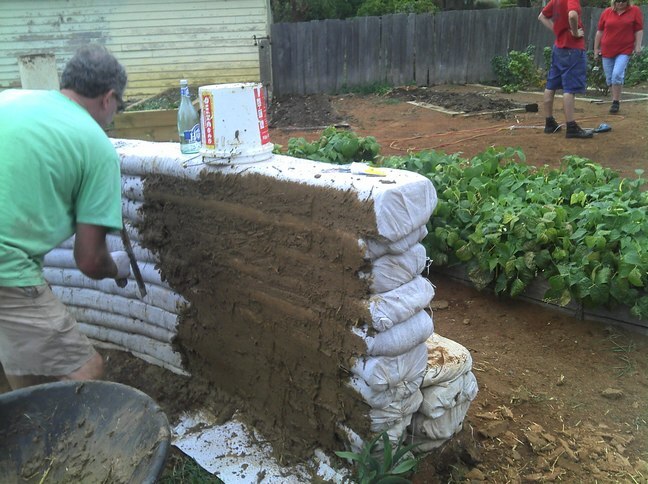 This was put on the blog at https://greentasreno.wordpress.com/2011/07/25/earthbag-wall-building/ This was a success, but as the months passed by things stalled. 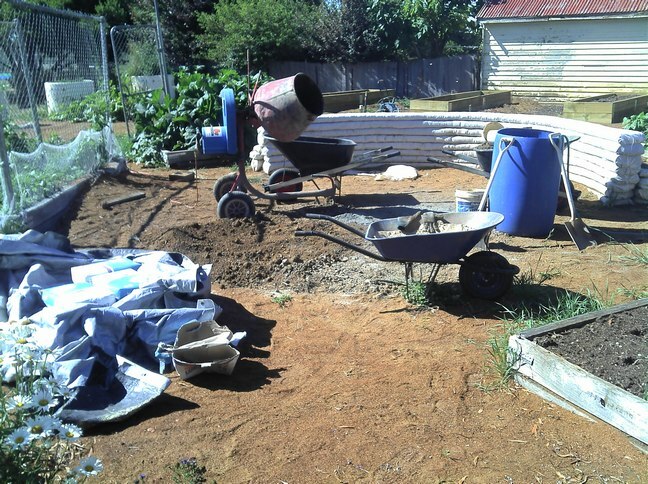 There were a couple more rows of earthbags added but after checking for stability we decided to remove them,as they had not been tamped sufficiently, and add a couple of new rows. The seat on the outside was stepped up twice to make three different seating heights. Now in the last couple of months there has been much action and the wall has been rendered with a mud/straw render coat, then a lime plaster coat and now is getting its final limewash coats. 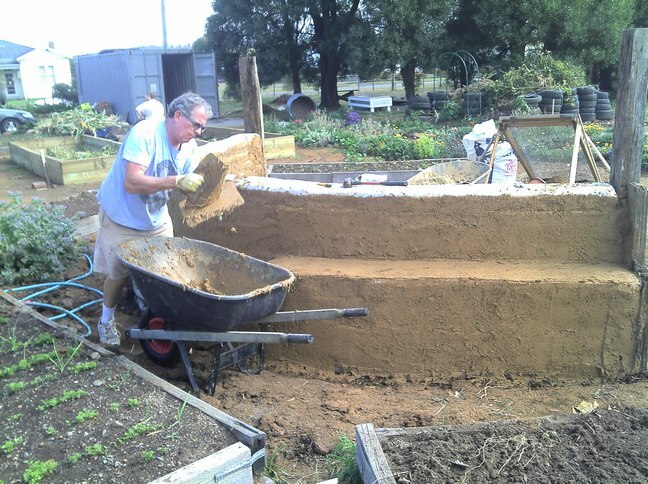 The mud render was made from clay that was spoil from a hole dug for an underground water tank. Sand came from a pile that was left over from the school cricket pitch and chopped straw added. Several test patches were trialled, each with a different ratio. Finally we settled on one clay, three sand, and a good handful of chopped straw. 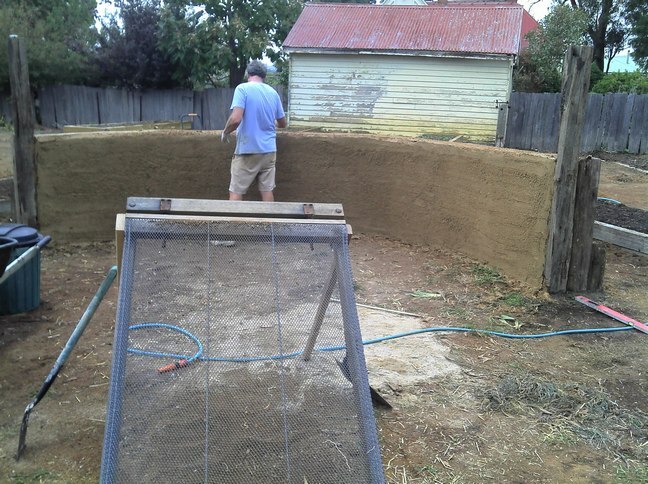 The first coat we put on filled the voids between the earthbags. After this we decided that the clay needed screening. An old bed frame with the old fashioned chain link stretcher was purchased from the tip shop for a whole $5. This worked a treat, enabling us to just shovel the clay through the mesh and make a finer render. After the base coat had dried We decided that the ends of the wall needed attention. 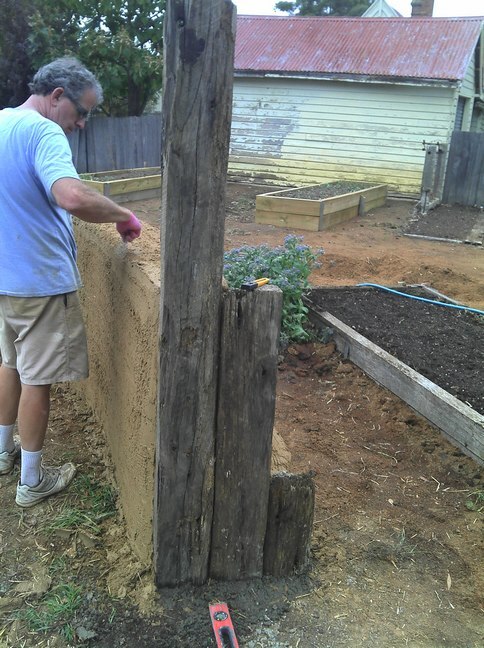 There were plenty of old sleepers in the scrap pile in the Community Garden so we used those to create two ends. Then after the base coat a scratch coat was put on and left to dry thoroughly. 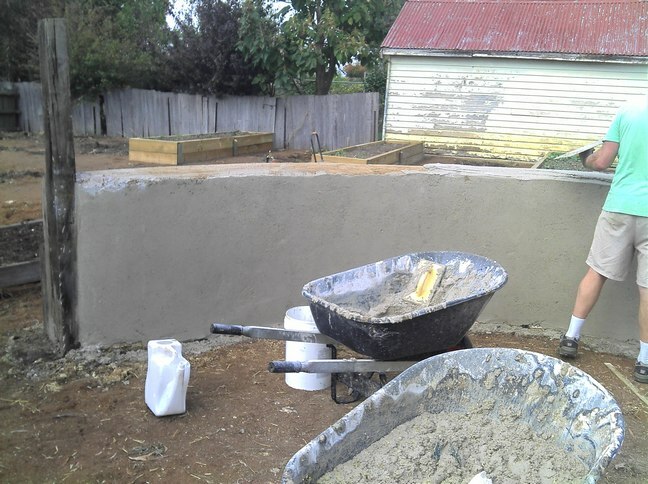 The final coat was a lime/sand plaster mix with handfuls of chaff thrown in as an extra binder. 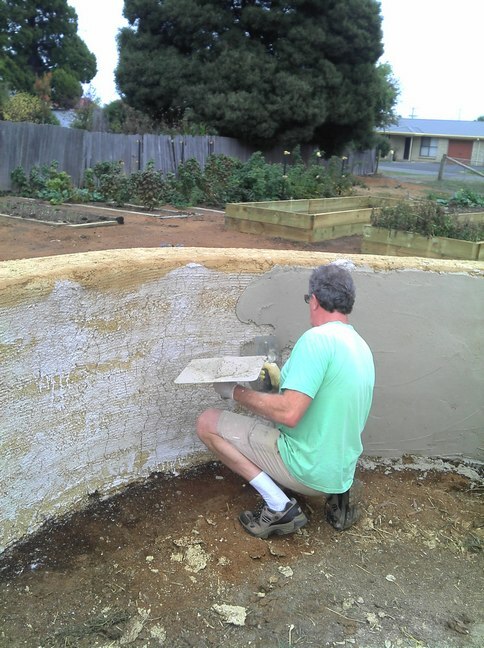 Chris did a great job as a master plasterer and I acted as labourer. 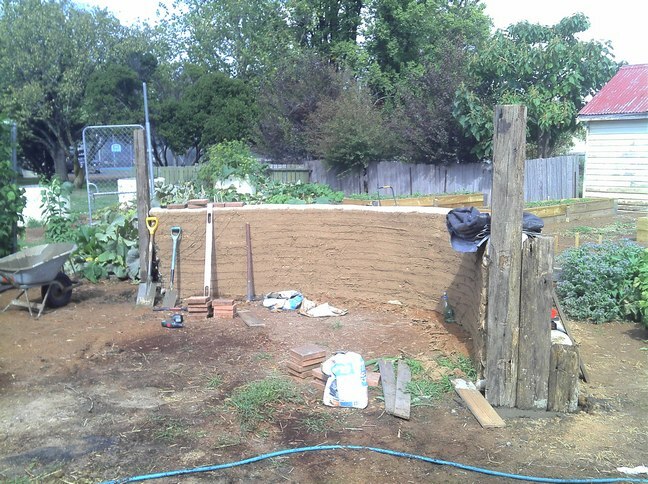 The next stage is to get the local Primary School involved in making some pavers to be mortared to the bench seat on the outside of the wall and to create a bench inside using cob walling techniques and gabions.